This activity is based on a page from the coding index used by the Culper Spy Ring, a group of colonist civilians working as spies who gathered and reported intelligence to George Washington during the Revolutionary War. Caleb Brewster was a key member of the organization. Brewster served as a courier delivering messages to agents in Connecticut and Long Island across the Long Island Sound. His long-standing friendship with Benjamin Tallmadge, Washington’s chief intelligence officer, and his reputation as an expert seaman made him the perfect man for the job. In what ways did “ordinary” Americans contribute to the American Revolution? Why did the Continental army rely on contributions from civilians? How did women contribute to the Revolution? 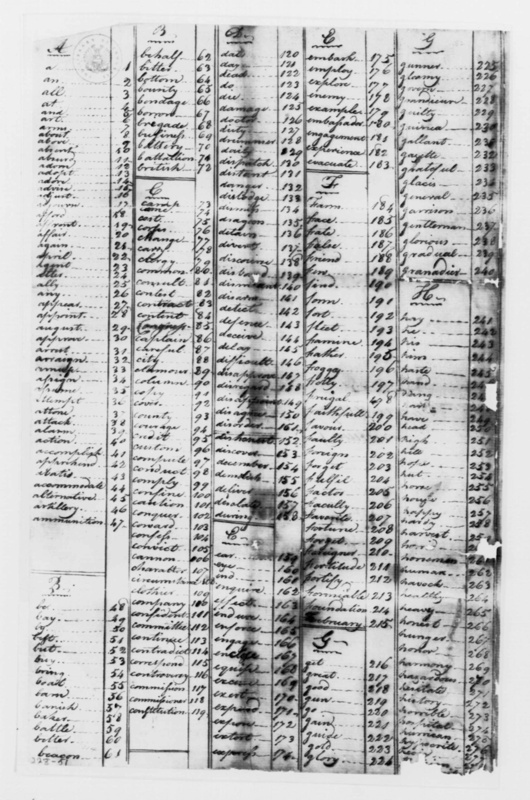 Sample page of the Culper Spy Ring Code – Library of Congress. Additional pages are available at MountVernon.org. What words can they recognize on the page? Why might some of these words need to be written in code? What are some benefits of using numbers instead of words? How might the results of the Revolution changed if these messages were discovered by the enemy? Create a map detailing one of Brewster’s excursions from the coast of Connecticut to Long Island. Write a letter from the perspective of General Washington to Caleb Brewster. Have students create their own coding system and write a secret message between spies. ConnecticutHistory.org: Caleb Brewster and the Culper Spy Ring by Andy Piascik.